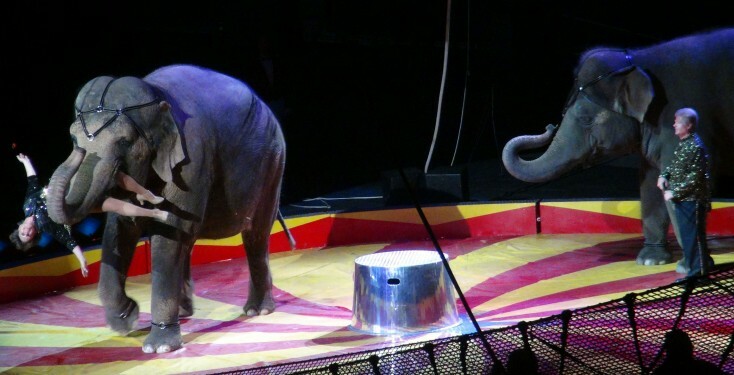 Pictured above, Tai in the ring with Shrine Circus. The tricks that appeared in Water for Elephants were taught with electric shocks and beatings. The stars moved on, Tai’s nightmare continues. Footage released by Animal Defenders International (ADI) today shows the stars of Hollywood movies ‘Water for Elephants’ and ‘Zookeeper’ back in the circus, appearing with El Zagal Shrine Circus, in Fargo, North Dakota. The video shows presenter Joanne Smith, a trainer with animal act supplier Have Trunk Will Travel, confirm that the two elephants giving rides and performing headstands with the circus are Tai, star of Water for Elephants and Rosie, who appeared in Zookeeper. If you want ADI to keep exposing the suffering and working to save elephants like Tai, donate now. ADI released the footage after the film’s makers, stars, American Humane, and Have Trunk Will Travel themselves, claimed the elephant had been treated with love and affection and never abused. ADI sent copies of the video to the studio, producers, director and stars Robert Pattinson, Reese Witherspoon. Pattinson and Witherspoon had previously issued statements expressing how much they cared for the elephant that shared the screen with them. No one replied. Letters were also sent to the makers of Zookeeper and its star, Kevin James. No response. Today, ADI have posted the latest video on the Facebook pages and Twitter feeds of Robert Pattinson, Reese Witherspoon, and Kevin James, asking that they speak out against the abuse and support the ADI campaign. DVDs are also being mailed to the stars. The exposé by ADI of Have Trunk Will Travel, suppliers of elephants to almost countless adverts and movies, and the recent halting of TV show Luck, following the deaths of horses, shows that animal suffering and abuse remains a serious problem in movie and TV production. A baby elephant being hit, having the air supply through his trunk cut off, and even being hooked inside the mouth. ADI Victory! Santa Ana Zoo and the Orange County Fair recently ended elephant rides using animal supplied by Have Trunk Will Travel, after months of campaigning by ADI and a coalition of advocates and elephant experts using the video evidence gathered in our undercover investigation. ADI are currently urging people to contact members of Congress asking them to sign HR 3359 the Traveling Exotic Animal Protection Act, launched in November by award-winning TV show host Bob Barker and CSI start Jorja Fox, to restrict the use of wild animals like elephants in traveling circuses. Reese, please do the rigbt thing.